On the Martin Luther King weekend, over 40 Tikvah campers, Atzmayim participants, alumni and staff gathered by plane or car, for Camp Ramah’s Tikvah/Atzmayim Shabbaton. 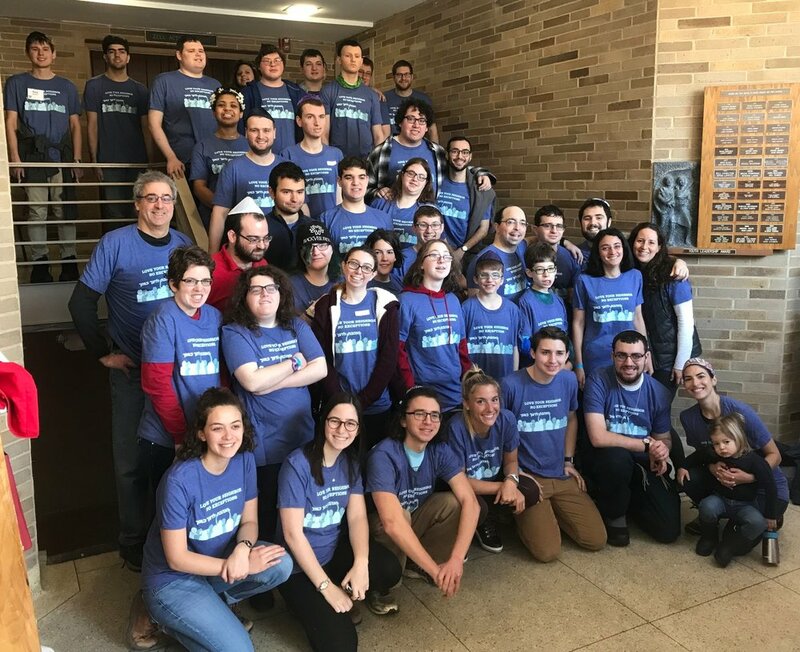 Hosted by North Suburban Synagogue Beth El in Highland Park, Illinois, the Shabbaton was equal parts youth programming, a reunion for current and past campers, and a Camp Ramah Shabbat experience to rival those of the summer. Unlike previous years, this Shabbaton took place in the setting of a synagogue, with participants and staff staying at the homes of Beth El community members. The theme of the Shabbaton was ‘Love Thy Neighbor—No Exceptions’. The weekend was filled with programs in which participants discussed the meaning of loving one’s neighbor, and learned about the importance of acting with respect and understanding to those around you. In one program, current Tikvah campers began with getting to know their neighbors better by learning about each other's favorite leisure activities. Afterwards, the campers played a form of “Human Bingo” in which they had to fill out one bingo sheet by engaging in conversations with people around the room, and another bingo sheet by using various social skills in those conversations. This activity offered a chance for campers to practice loving their neighbors by encouraging them to show interest in their peers by having a respectful conversation. “I have 3 jobs. On Sundays I am a teacher’s assistant for kindergartners at my Temple’s religious school. On Mondays and Fridays I work at InReach which is a facility for children and adults. They provide services to individuals with developmental disabilities like day programs, support, workers, and supported housing. I am an office assistant and receptionist. After hanging out in the synagogue on Shabbat, participants got some energy out during a trip to Altitude Trampoline Park in nearby Skokie. Everyone had a blast jumping all over the place, shooting hoops, falling into a foam pit and seeing who can jump the highest. Tired and sweaty, participants ended the night sharing stories and laughing with one another on the bus back to Beth El. On Sunday morning, there was already talk of the next Shabbaton. Our campers and participants will be talking about this weekend full of friendship until they board the buses this summer—perhaps even until the next Shabbaton. The emotional hugs and wide smiles showed a renewed love of one’s neighbors and marked a successful Shabbaton.